I Need More Glitter: I Need More... Bow Ties. I Need More... Bow Ties. I'm a lady who loves bow ties. Love them on the silent-but-strong mannequins at Nordstrom. Love them on Handsome Him (AKA my dashing husband). Love them for the fabrics from which they are made. LOVE THEM! 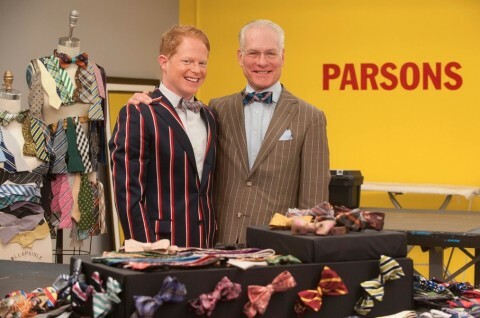 So, how is it that Lifetime's Project Runway read my mind and fashioned a recent episode (Season 12, Episode 4: Tie the Knot) around my obsession? AND featured an amazing organization that promotes equality? Fabulous! Way to go Jesse Tyler Ferguson. The winner deserved to win, no doubt about it. But his design wasn't my personal favorite. My favorite came from Dom Streater. Did you see her dress? So beautiful and so fresh.